Clydesdale Men’s 1s completed their Men’s National Indoor Division One season on Saturday after falling to defeat against Grove Menzieshill in their opening game of day at Bell’s Sports Centre. Clydesdale required a win against Menzieshill and to hope Kelburne would beat Grange immediately after to qualify for the Grand Play-Off Semi Finals. And the M1s found themselves in a great position at half time in their game – being 5-4 up on the ‘Hill, as their already slim chances of qualifying for the Semi Finals were looking like improving. But the Dundee side stormed back to devastating effect take the contest 9-6 and thus end ‘Dale’s Play-Off hopes. Clydesdale would enter the 5th/6th Play-Off spot where they played Dundee Wanderers in their final game of the season. Sadly, the M1s succumbed to their second defeat of the day, narrowly losing 4-3 to officially finish 6th in MNIL 1. 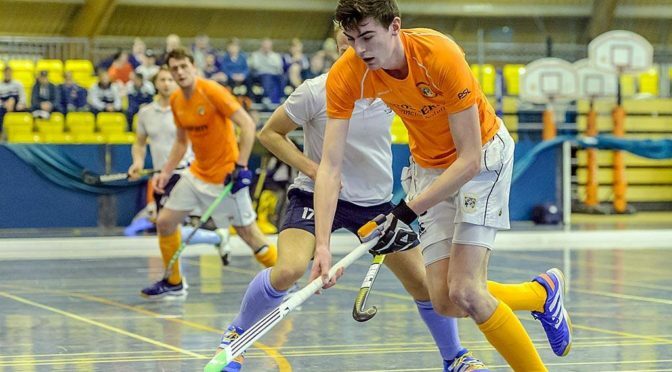 Clydesdale Men’s 2s ambitious late challenge to be champions of Men’s Regional Indoor Division One were ended after defeat in the first of their final three games at Forthbank. The M2s required three wins and a 27 goal swing in their favour to take top spot in Regional One. But they fell at the first hurdle, losing 5-4 to Western Wildcats 2s, despite a positive performance. The M2s did win their second game by the same scoreline against Grange 2s but came unstuck in their final game – losing 5-2 against Hillhead 2s. The results meant that the M2s finished fifth in the league, taking 22 points from a possible 33. All the more impressive given that the M2s – captained by Alex Ingram – completed an entire indoor campaign without a goalkeeper. In the four outdoor games that took place on Saturday, all four Clydesdale and Clydesdale Western teams lost without registering a single goal to their name. The M5s lost 4-0 away to a high flying Anchor 1s side in Men’s West District Division Three, whilst the L6s lost by the same score at home to Arran 1s in Women’s West District Division Three. The unluckiest of the four teams were probably the L4s, who narrowly lost 1-0 at home to Women’s West District Division One’s league leaders, Rottenrow 1s. This was despite having a number of chances that on another day could have seen them take a point. The L5s hopes of promotion from Women’s West District Division Two have taken a huge dent following their second successive league loss – this time away at East Kilbride by two goals to nil. Clydesdale Western 2s season in Women’s National Indoor Division Two came to an end after they missed out on a Promotion Play-Off Semi Final spot at DISC on Sunday. The L2s required Granite City Wanderers to not pick up three points against Inverleith before the L2s played and beat Kelburne 1s in their final crossover game. Inverleith held up their end of the bargain, but the L2s drew 4-4 to Kelburne 1s to finish third in their crossover group by goal difference. This meant the L2s would enter the 5th/6th Play-Off spot to play Bon Accord 1s in what would be their final game of the indoor season. The girls lost 4-3 to the Aberdeen side, which confirmed their final position in WNIL 2 as sixth in the league. Clydesdale Western 5s bounced back from league defeat on Saturday to qualify for the Women’s West District Plate Semi Finals following their home win against Kelburne 3s at Titwood on Sunday. The L5s had been on a great run of form in both league and cup competitions but had recently been brought back down to earth after two league defeats – one of which was against Kelburne 3s. But Trish Lonergan’s side were back to their best to see off their Paisley opponents, with goals coming from youngsters Emma Murray and Iona Denholm. The L5s will now play in the Semi Finals of the competition – opponents and dates are to be confirmed.